UDM Downloads > SWiJ Web Buttons Creator! Create exceptionally beautiful Buttons for your Websites and Software Projects easily with the SWiJ Web Buttons Creator. Within just few simple steps you can create from a professional button image to a bar of navigational buttons which can be directly used in your websites. The Web Buttons Creator comes with a Themes Gallery with high quality templates to select from, which can be applied to the entire buttons in your project with just a click. Key Features, * Simple and easy to use interface where you can create up to 31 buttons in one project easily. * Create single state, two state and three states of button images effortlessly for a single button. * Professional Themes Gallery of over 50 high quality templates and over 500 themes. * Change the Button Shapes according to your design needs. * Both Horizontal and Vertical directions of navigation buttons supported. 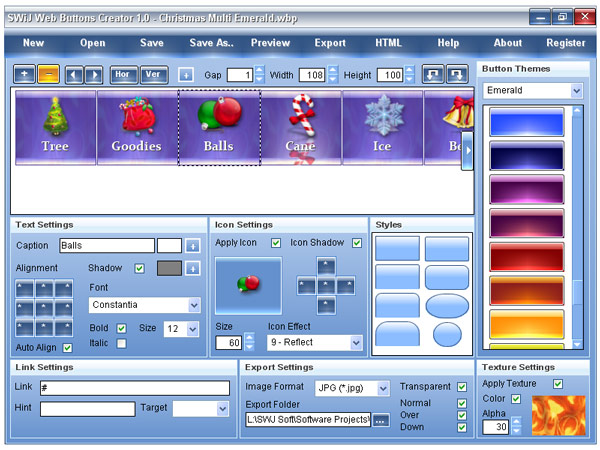 * Easily adjust the Width and Height of the buttons individually or for all at once. * High quality button text rendering with Shadow and Alignments. * Button Icon feature with support to multiple image formats including PNG and 32-bit Icons. * 9 different icon effects can be applied for Mouse Over event. * Button Texture support with color and grayscale blending. * Edit hyperlink, target frame and button hint for each buttons easily. * Single click button image exporting feature with support to various image formats including PNG. * HTML Code for the navigational buttons to insert into your websites. And more... Free Themes, Icons, Textures and Fonts with the full version packages.